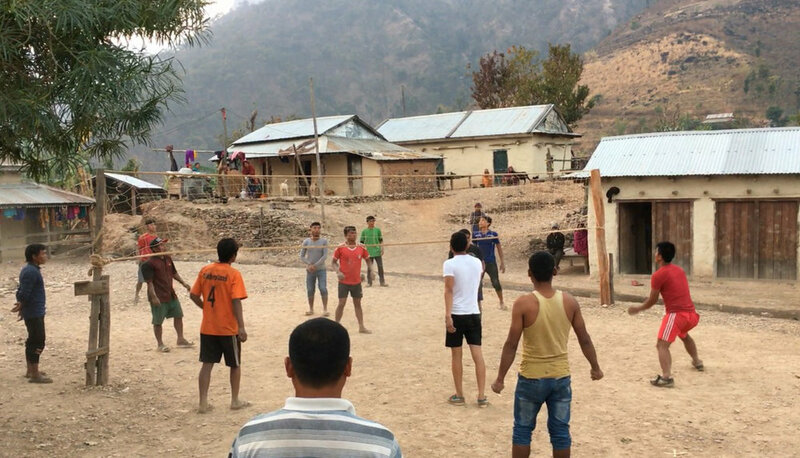 As part of our partnership with The Great Nepalese Restaurant we are running a 'Spot The Volleyball' competition. To participate visit The Great Nepalese Restaurant on Eversholt Street (nr. Euston station, London) to pick up a entry card - and have a delicious Nepalese meal while you are there! The volleyball has been removed from this image, to enter, you simply need to mark an 'X' where you think the missing ball is. Entries cost 50p and you can only enter by visiting The Great Nepalese Restaurant. Entries close at midnight on December 1st 2018. 300g of freshly roasted coffee beans from our project work in Solukhumbu. The image on your entry card is a scene from Deurali, a hill top village in Nawalaparasi in southern Nepal. We have removed the volleyball from the picture. Mark an 'X' where you think the centre of the missing ball is. Enter your first name, surname and email address on the back of the card. If you would like to learn more about The Glacier Trust and our work, please tick the box at the bottom of the card. Return the card along with your 50p entry fee to a waiter at The Great Nepalese by midnight on December 1st 2018. The Glacier Trust (TGT) is a UK registered charity (no. 1124955) and the sole organisers of SPOT THE VOLLEYBALL 2018. Competition entries will be judged by TGT Co-Director Dr. Morgan Phillips on December 4th 2018. Please use a ball point pen to mark your 'X'. The winning entry will be the one where the exact centre of the 'X' is the closest to the exact centre of missing ball. The second placed entry will be the that is the second most accurate. The competition is open to all All Nations Tournament players and spectators and the general public. Any entries that are marked with two or more 'X's will be automatically disqualified. In the event of a dead heat, a random draw will be conducted by TGT to determine first and second place. The draw will be filmed and published on the TGT website. No staff, volunteers or trustees, close friends or family members of TGT or The Great Nepalese Restaurant are allowed to enter the competition. It is not necessary to make a purchase at The Great Nepalese Restaurant in order to play Spot the Volleyball. 1st Prize: A meal for two worth £40 at The Great Nepalese Restaurant. 2nd Prize: 300g of freshly roasted coffee beans from TGT’s project work in Solukhumbu, Nepal.